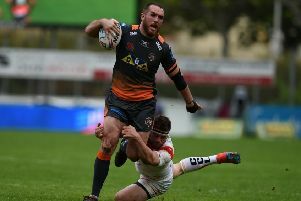 Rejuvenated forward Oliver Holmes believes Castleford Tigers will send out a statement to the other Super League teams if they can notch a win against St Helens at the Mend-A-Hose Jungle tonight. Back rower Holmes is enjoying a new lease of life as a Super League regular again after getting free of injury for the first time in two years and hopes to play his part as the Tigers look for a big win over opponents they have lost to twice in 2018. He admits his team face a big challenge against the league leaders, but sees the game as a good opportunity. “If we can get a win I think it will be a real statement to the rest of the league,” said Holmes. “We’ve gone quietly about things. Saints have been the talk, Wigan have come good at the minute, but if we can knock this game off people will stand up and take notice again. “They are consistently winning aren’t they Saints and Wigan at the minute? Warrington have only just lost their first match in 10 or whatever it is so those three Lancashire teams are setting their stall out in the league at the moment. Holmes reckons that the Tigers are going into tonight’s game in good spirits and with their form bucking up since the arrival of some better weather. He explained: “It’s been a long time coming. It took us longer than we’d hoped to put in a performance like that against Leeds on both sides of the game – with and without the ball. “We were pretty much excellent for 80 minutes which is what we’ve been aiming for – an 80 minute performance. We’ll take confidence from that Leeds win and hopefully into Thursday. Holmes has been restored to his left edge role this season, but has had to get used to many different partners with injuries making it difficult for consistent team selection. He added: “It’s a bit mix and match all over the field at the minute isn’t’ it? We have Shenny at full-back, Truey’s been playing full-back then coming into the halves. Jy’s stepped in and done fantastic with both games he’s played in.